Provides trauma and medical care and transport in the western two-thirds of Baca County as well as the southern edge of Prowers County, the eastern edge of Las Animas County, and a portion of southeastern Bent County in southeastern Colorado. A small number of paid staff and volunteers operate this rural service with professional training ranging from the level of National Registry (NR) Emergency Medical Technician (EMT) - Intermediate to NREMT Basic and First Responder. SECHD offers 24/7 coverage, 365 days a year-regardless of time, weather, or holidays. Is owned and operated by the District which encompasses the western two-thirds of Baca County and is under the authority of the governing body of Southeast Colorado Hospital. Based in Springfield, SECHD Ambulance Service provides basic and advanced life support coverage to a population of about 2,800 living in an area of approximately 1,900 square miles. This includes the towns of Springfield, Pritchett, and Campo as well as Two Buttes Reservoir. SECH Ambulance Service also periodically helps to provide coverage to the edges of several neighboring counties - Prowers, Las Animas and Bent. At times, the coverage zone has expanded south to assist Oklahoma and southwest to New Mexico as well. In addition, SECH Ambulance Service provides transfer services from SECHD to higher level hospitals out of the area and from these hospitals back to SECHD. In 1969, SECH officially opened its doors and thus began the first true ambulance service in Springfield with a 1967 Chevy Suburban converted to function as an ambulance. Frank England, an orderly at the hospital in the 1970s, recalls being part of the team that painted the ambulance and got it ready to use. He was also one of those who responded with the ambulance when a call for help came. "When an ambulance call came in, one of the aides (usually me if I was on duty) would call a driver from a list of volunteers. I would continue to go down the list until I reached the first available driver. When the driver arrived at the hospital, we would go out to pick up our patient. We didn't have much in the way of supplies and equipment in the ambulance. There was an oxygen tank, a blood pressure cuff, stethoscope, bandages and resuscitation bag. The nurse aides had no emergency training like today's CPR aside from the experience they got from working in the emergency room. There wasn't any direct radio contact with the hospital as we have today. If we needed to speak with anyone at the hospital, we called the sheriff who in turn called the hospital and relayed questions and answers." Lovell made history along with Frank England and a few others when they became Springfield's first EMTs in 1976. Worth Poteet who was also employed by the hospital and took that first EMT class, assumed leadership of the ambulance service in Springfield. By 1977, Poteet and Lovell were the only EMTs still responding with SECH Ambulance Service, and the need to recruit more help became quickly evident as they were "on call" for emergencies 24 hours a day, seven days a week. A second class was offered in 1978, taught by Dr. Antonio Manalo in Springfield. Over the next nearly 40 years there have been significant changes in EMS during ranging from improvements in supplies such as c-collars, gurneys, monitors, and defibrillators to dramatic changes in ambulances and the number of pre-hospital medications that can now be given. Dennis Ring, one of the EMTs who came out of that second EMT class, proudly recalled the efforts of their team of EMTs and the community to raise money for the first new ambulance, a 1979 Ford Type III, a box type unit purchased in 1979. It was a monumental effort as they had to raise $30,000, a feat that seemed impossible to some at the time. Ring volunteered with SECH Ambulance until 2006 when he became a full-time staff member and retired in 2014, retaining his certification for a period of 36 years. Change occurred rapidly in the early years, and leadership of SECH Ambulance was not an exception. After Poteet turned it over, the role was shuffled among a few other hospital employees including RN Dottie Woodhouse and in 1991, Tom Lovell, then head of the Lab Department at SECH. It became evident that a significant amount of time needed to be devoted to the ambulance service in order to maintain a high standard of care. Having a full-time job elsewhere in the hospital made this difficult, so in 1992, the job was offered and accepted as a full-time position to Rick Hartley, former hospital board member and volunteer EMT. In late 2015, the position changed hands once again and was passed down to another SECH Ambulance volunteer, EMT-Intermediate, Cherilyn England. Our service has seen a number of changes among our fleet of ambulances over the years as well. Former Director Hartley recalled how after trading in the 1979 Ford ambulance for a new 1987 Chevy Type I (box type), one day it caught fire due to an electrical short and burned. With the insurance money, they were able to replace it with a 1991 Ford Collins Type III Diesel (a box type), but while waiting on that ambulance to arrive they purchased a used Ford Type II (van type). In 1992, Hartley, applied for a grant to buy a new ambulance with 4x4 capability for emergencies occuring in harder to reach locations or on poor road conditions. The grant, received from the State of Colorado, was used to purchase a 1992 Ford Type III ambulance as well as a blood pressure monitor and two automatic defibrillators. One stipulation of the grant was that the older used ambulance be placed in service elsewhere in the district. At the time, the Pritchett/Kim Quick Response Team (QRT) based out of Pritchett was in need of a unit, so the Ford van type ambulance was placed there. Later grants allowed SECH Ambulance Service to again update the fleet first with a 1997 Ford Type I, then a 2003 Ford Type I, a 2010 Dodge Type I, and most recently a 2016 Dodge Type I. In addition, in 2001, SECH Ambulance Service became one of the first agencies in the state of Colorado to purchase a smaller transfer ambulance, in this case, a converted 2001 Ford Excursion. In 2006, a GMC Yukon was added to the transfer fleet and then replaced in 2016 with a new Chevrolet Suburban. SECH Ambulance Service now maintains two box type ambulances and the two smaller transfer units. All four units are stocked with the required equipment and supplies to operate an Advanced Life Support service. As replacements have occurred, the older model units have been donated or sold to other ambulance services or local QRTs. QRTs have played an important role in Baca County's Emergency Medical Services. They were born out of a need for a faster response to emergencies in the most rural locations. They generally do not transport patients but instead provide supportive care until the nearest ambulance arrives. In the mid-1980s, at the encouragement of Worth Poteet, EMTs in the Campo area started the Campo QRT. Campo's first QRT unit, a repurposed 1973 Chevy model van fondly recalled as "the brown bus," responded to many a patient in need before it was later replaced by a box type unit. Campo QRT is currently utilizing a 2003 Ford Type 1 vehicle donated by SECHD Ambulance Service. Though they also assist Walsh Ambulance Service at times by responding to calls east of Campo, Campo QRT, is now a subsidiary of SECH Ambulance Service. Many folks have graciously volunteered their time in service through Campo QRT. SECH Ambulance Service first housed ambulances in what is now the maintenance building north of the hospital. The building was initially shared with Central Supply, though Central Supply eventually moved. The ambulance service continued operating from that location until 1999 when Director Hartley applied for and received a grant to buy a different building and remodel it. The old Auto Parts building on Kansas Street was purchased. Having significant construction experience, Hartley and his son, Jered, transformed the building into the current ambulance station with attached classroom and office space. No one understood the work and sacrifice that has been required to make our service what it is today better than Rick Hartley, former EMS Director. Rick began volunteering as an EMT in the 1980s and became the EMS Director for Southeast Colorado Hospital Ambulance Service in 1992. Recognizing the need for an advanced level of pre-hospital care in our rural area, Hartley chose to increase his own level of training becoming an EMT-Intermediate/85 in 1995 then an EMT- Intermediate/99 in 1999 and finally Southeast Colorado Hospital's first Paramedic in 2008. Additionally, he taught countless hours of CPR, EMT and Farmedic classes and numerous other safety and injury prevention classes. He also served for several years as one of Baca County's Deputy Coroners. In the early 1990s, he founded the Springfield EMS Association, a non-profit that supports local EMS in fundraising and education. His tireless grant writing efforts resulted in over $1.5 million to support state-of-the-art supplies, new ambulances and training for his community, agency and region. This included acquiring better supplies, purchasing new ambulances, and providing training for the community, SECH Ambulance Service employees and volunteers, SECH District and the Walsh Hospital District Ambulance Service. Rick's true love of EMS, though, was always in providing hands-on emergency care to those in need. While his job meant meeting people at the worst moments of their lives, he was always the calm in the storm. His skill and compassion left people with the knowledge that someone was fighting for them, and the feeling that somehow everything would be okay. Tragically, in November of 2015, Rick Hartley lost his life in the line of duty. 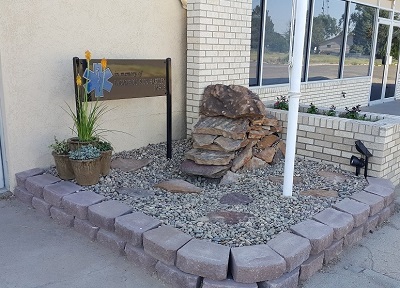 His memory, dedication, and passion for EMS live on in the legacy he built here at Southeast Colorado Hospital District. In 2016, SECHD Ambulance Service responded to 442 calls many of which involved multiple patients. Of those calls, 234 were 9-1-1 related medical or trauma incidents, 20 were interfacility hospital transfers, 88 were flight shuttles, 56 were standbys, and 44 were cancelled calls. This is a significant change over the last 25 years as the call volume in the early 1990s was only about 70 to 100 calls per year - a nearly 600% increase in activity. In 2017 SECH Ambulance Service logged over 18,000 miles. This 24 hour per day/seven day per week coverage is provided by one full-time paid Emergency Medical Technician (EMT)-Intermediate/99, one per diem EMT-Intermediate/99, three full-time paid EMT-IVs, and a small handful of volunteer EMT-Basics, First Responders and drivers. Campo QRT responded to 56 calls in 2016 traveling over 800 miles within the response area. They currently operate with one EMT-IV, one EMT-Basic and one or two volunteers. SECH Ambulance Service with the support of Springfield EMS Association offer a free CPR class to any in the community on the last Friday of each month. As a state approved training center, SECH Ambulance Service also periodically offers EMT courses and other trainings. Communicate with your doctor through a convenient, safe, and secure environment. Click the "Upcoming Events" bar above for the April Specialty Clinics. Good Friday is April 19th. Easter is April 21st. The District was established in 1966 as a not-for-profit hospital and officially opened its doors in 1969 with 23 acute care beds.